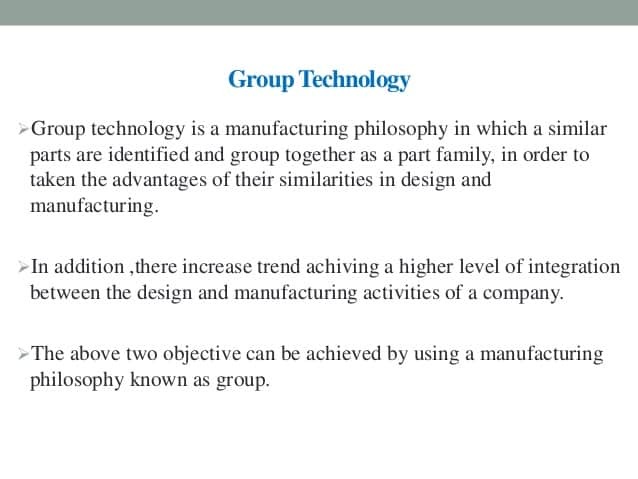 Group technology (GT) is a concept that is currently attracting a lot of attention from the manufacturing community. GT offers a number of ways to improve productivity in the batch manufacturing. The essence of GT is to capitalize on similarities on recurring tasks. GT is, very simply, a philosophy to exploit similarities and achieve efficiencies grouping like problems. normal good engineering practices. It is impossible to say who first practiced GT. There are reports of it having been used in Germany in the 1930s. In an international Conference held in Stockholm in 1947, the basic groups were explained by C.B.Nanthorst. In Italy M. Patrignany was an early exponent of this technology. However, little of this appears to have been in English. First published work was from the USSR by S.P.Mitrofanov in 1959 and there after subsequent books were published by F.S.Denyanyuk and E.K. Ivanov.The first reported work on GT outside Russia was done by a French Forges et Ateliers de Construction Electriques de Jeurmont – and this was about in Machinery in 1962. Subsequently, several British companies conducted considerable work in this field. There have also been considerable studies done by various consultants in the Universities. The significant contribution by J.L.Burbidge in the 1 960s led to GT as A total Manufacturing Philosophy. According to Burbidge, following are the advantages after introducing GT in manufacturing. a. Short throughput times because machines are closed together. b. Better quality because groups complete parts and the machines are closed together under one foreman. c. Lower material handling costs because machines are closed together under one foreman. d. Better accountability because machines complete parts. The foreman can be made responsible for costs, quality, and completion by due date. e. Training for promotion for promotion since GT provides a line of succession, because a group is a mini-department. f. Automation GT is a first evolutionary step in automation. h. Morale and job satisfaction since most workers prefer to work in groups. Studies undertaken by N.L.Hyer indicate the following significant savings after implementing GT Snead prepared a summary matrix, listing the benefits listing benefits achieved for the various GT. One may question whether a cellular concept is applicable to CIM systems. Some studies have shown that grouping machines to machine cells may limit the manufacturing system flexibility. However, industrial applications have proven that it is virtually impossible to implement a large scale CIM subsystem using a cellular concept. Here after, the automated manufacturing systems that cellular approach can be called as, Cellular Automated Manufacturing (CAMS). Volume of information a large-scale CIM subsystem is typically large, and it is too expensive to effectively process information without the system’s decomposition. In a typical CIM subsystem, automated material handling carriers are used (AGVs and Robots). Each of the two carriers can tend a limited number of machines. Some machines have to be grouped together due to technological requirements. For example, a forging machine and a heat treatment section. Although in most of the currently CIM subsystems, the degree of automation is higher than in classical manufacturing systems, humans will be, for a long time, an integral CAMS is easier to manage than the entire system.